We don’t sit cats. We serve them. Cats occupy a special place in Daniel’s heart and home. His cat Pixie was adopted from the Berkeley municipal animal shelter after she was found under an overpass. Daniel has volunteered at the Berkeley animal shelter for many years, socializing and comforting cats of all ages and temperaments, and also volunteers at the Antioch animal shelter. Ironically, Daniel didn’t grow up with any cats in his household. However, that didn’t stop him from getting plenty of interaction and developing a deep fondness for them, as his grandmother who lived next door fostered up to 30 cats in her home at any given time for the El Dorado Humane Society. He can still remember vividly his favorite cats, such as the gregarious Raisin and the slightly overweight Fluffy, a cat who had a tendency to gain a lot of speed coming down a flight of stairs. Daniel also loves photographing animal portraits, especially cats. He takes great care in emphasizing their personalities and capturing what makes them unique. Of course, the feline’s natural beauty is always something that makes his images so stunning. You can view some of his work on the gallery page. Daniel has also released for the second year in a row Berkeley Cats, a calendar that profiles some of the cats that reside in Berkeley. Daniel looks forward to having his team of cat sitting extraordinaires help you out and comfort your kitty. In 2014, when Daniel was volunteering at an animal shelter, a friend mentioned a cat sitting business. Having never heard of such specialized pet-care company idea, Daniel got immediately interested. He did not feel personally satisfied with his employment at the time and was looking around for better options. Shortly after, The Comforted Kitty was born. By 2017, it became a team of 7 full-time employees. In 2019, it has established a second location in Las Vegas. Fast forward to today, where The Comforted Kitty serves hundreds of clients annually, making sure they are all very well taken care of and that they enjoy all of the comforts of their life despite the absence of their guardian. Cats are part of our families. But too often pet sitters don’t recognize the profound importance of this. In the modern “gig economy” where you can hire almost anyone for anything with a phone app, it can be very difficult finding a cat care provider who is reliable, responsible, and responsive. That is why we offer a higher level of care and professionalism. We cherish their companionship and want the best for them when going away on travel. At The Comforted Kitty, it is our honor and privilege to hold your trust in our meticulous care we provide to your cat and home. And we cherish the peace of mind we deliver to you that you expect and rightfully deserve. In our pledge to provide you with the highest quality care of your cat and home, we proudly recognize and respect the following rights for which we strongly believe you possess when it comes to hiring a person to come into your home and care for your beloved feline family member. These rights stand true regardless of whether you hire our services or that of another company because they are the foundation to a deep and lasting professional relationship with your sitter that is built upon trust, transparency, and accountability. When a sitter’s actions fail to meet these rights, they should take full responsibility for such inappropriate and unprofessional behavior. Your trust should not be violated or taken advantage of. All our cat sitters have extensive experience in cat care. Comforted Kitty team members are dedicated to all our feline clients and their humans. Every one of our sitters is thoroughly vetted and background checked for the highest integrity, reliability, and professional capabilities. If you are not satisfied with our level of care for your cat and home after the completion of the requested sitting services, we will issue a full refund for the entire invoice. We never cancel last minute so you can enjoy your vacation, knowing that you have a reliable sitter who will always be there to care for you cat and home. We don’t just come over and play with your cat or just throw a bowl of food down and leave. 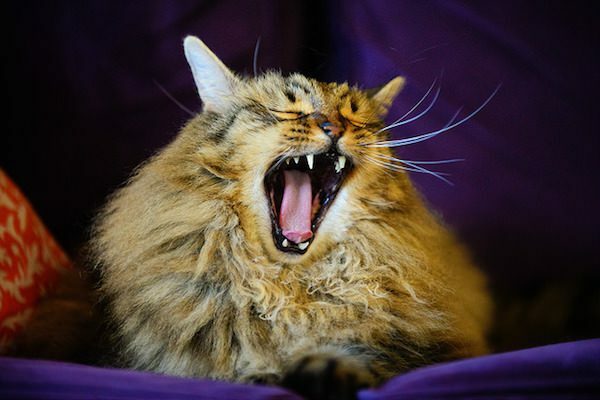 We actively observe your cat’s behavior and appetite and notify you immediately of any concerns. I can’t recommend The Comforted Kitty highly enough. Tip-top cat care. The Comforted Kitty is amazing! I am obsessed with my cats and given towards worrying and feeling guilty for leaving them at home while I travel, but knowing Daniel will be taking care of them makes me feel so much better! He sends great updates and photos, and I totally trust that he’ll spend quality time with them on each of his visits. I also appreciate that he’s always communicative and willing to help out even when I ask him on short notice – fantastic service overall!! Samantha brings over 15 years experience working with cats in a variety of settings including; veterinary and animal sheltering. She also works for a non profit cat rescue in Morgan Hill saving countless kitties lives. She is passionate about working with cats and brings years of medical knowledge and behavioral expertise. 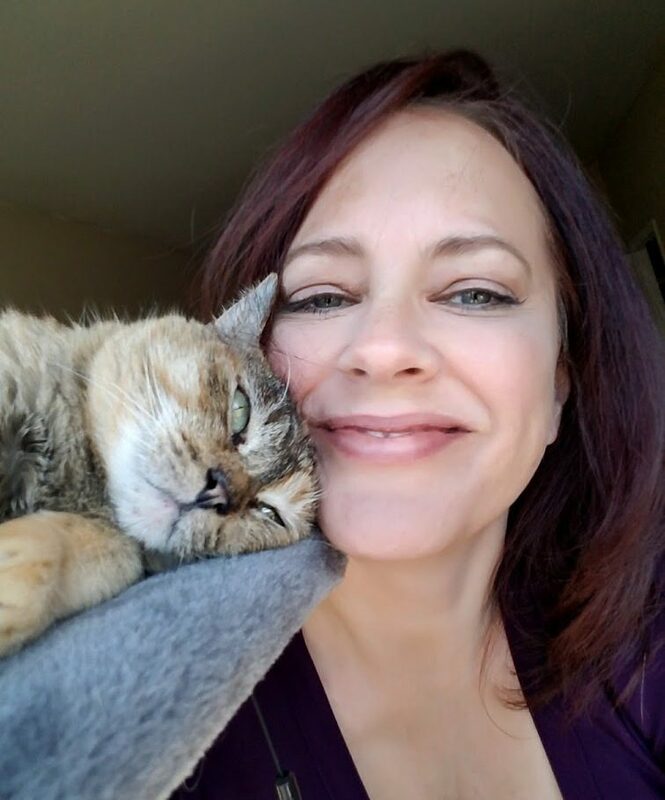 When she is not working with cats, she can be found at home with her own family of four kitties; Mister, Susu, Pixie and Kindle, hiking in nature, or at the yoga studio. She is so excited to be working for The Comforted Kitty and cannot wait to meet you fur family. She happily services Silicon Valley, including San Jose, Sunnyvale, Santa Clara, Campbell, Los Gatos, and Cupertino. Mar has been working with cats for many years. She has been a volunteer at the Marin Humane Society, worked with a wonderful cattery, and has assisted with veterinary care. She has an extensive knowledge of cats, their husbandry needs, and their unique behaviors. First aid trained with experience in administering medication, Mar makes a special point to make sure every cat she has the privilege to work with receives the best care imaginable. She also practices Reiki (calming, soothing, therapeutic touch) for pets and is a budding pet masseuse. She is proud to be the servant of two fur munchkins, Pixie and Po, and a chiweenie who thinks she’s a cat, Sirius. She happily services lower Marin County. Poppy grew up on an idyllic small farm in India, where she was surrounded by numerous animals including dogs, cats, parrots, chickens, monkeys, and even buffaloes! As a child she was immediately drawn to the wildlife and quickly learned how to care for a wide variety of animals. Since retiring Poppy has kept busy with and found deep enjoyment in cat sitting, dog walking, jewelry making, eco printing, gardening and intellectual pursuits in her spare time. Poppy is committed to the care and well-being of all the animals she comes into contact with and is both pet first aid and CPR certified. She happily services Berkeley, Albany, El Cerrito, Kensington, and Richmond. 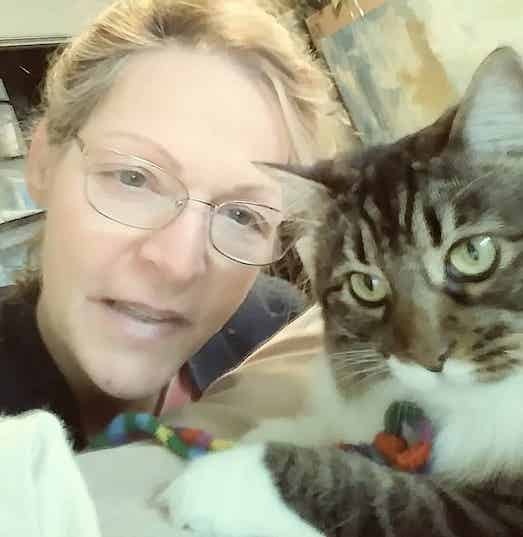 Barb, a 25+ year resident of Oakland, has had a lifelong affinity for cats, seldom living life without an active feline companion. For 15 years, with the help of many others, Barb participated in the trap, neuter and release efforts of a local feral colony.Barb is the proud caretaker of five elderly and special needs cats, three of whom began life as ferals. She finds great fulfillment and purpose in life in serving and helping others, humans and felines, alike. She happily services all of Oakland, Piedmont, Emeryville, Alameda, and northern San Leandro. Tera has been an animal lover since she was a young child, from when there was almost always a cat in the house. She brings several years of personal and professional cat-sitting experience with her. Before moving to the west coast, she worked for a professional pet sitting company in Connecticut and would also volunteer at her local animal shelter in her spare time. When not caring for your kitty, she enjoys spending time with her three cats: Freezepop, Rhaego, and Grey Wind (all rescues, and two were littermates rescued as feral kittens). In her spare time she also likes to paint, read, and travel. Tera understands that cats require lots of patience and routine, and has experience administering medications to both cats and kittens. She even once had a cat that was smart enough to learn tricks such as how to jump through hoops, ring a bell, and push a shopping cart! She happily services the South Bay and lower Peninsula, including Menlo Park, Palo Alto, Los Altos, Mountain View, Sunnyvale, Santa Clara, Cupertino, and Campbell. 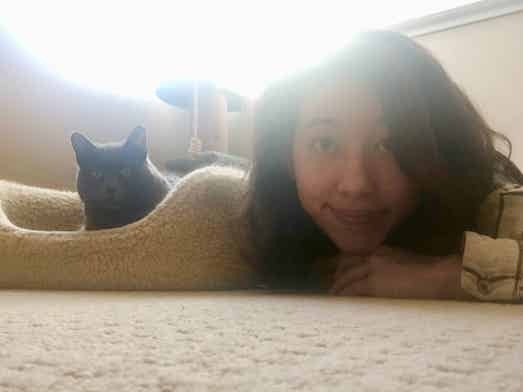 Erin Yen hails from the Midwest, where she’s cared for indoor and outdoor felines of every size, age, and personality! 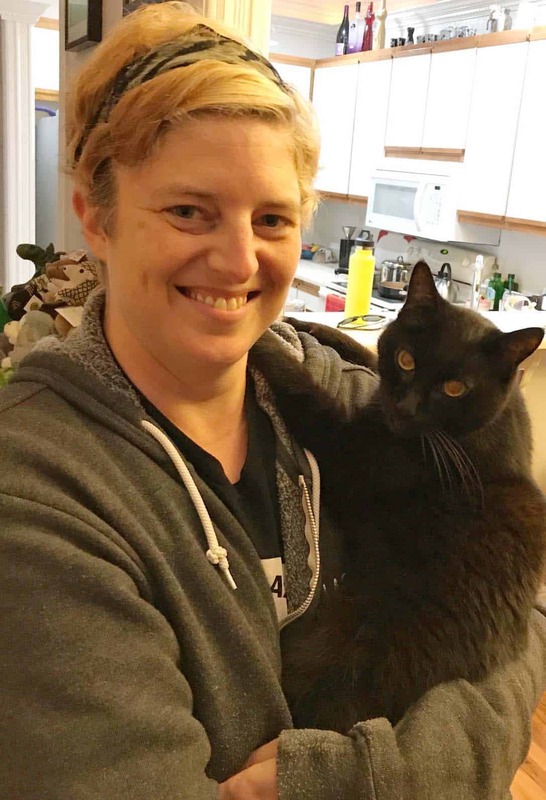 Using her expertise in kinesiology and the Alexander Technique, Erin prides herself in befriending kitties through deep understanding of instinctual movement. Erin has held titles such as professional dancer, personal home-care assistant, and pet handler and care extraordinaire. She knows that every cat has a unique personality to share, and Erin works to let your cat’s quirks shine. It is her goal to provide you with peace of mind during your time away by giving the same environment of love and support your cat(s) get while their family is at home. She happily serves San Francisco and the upper Peninsula. “We call Erin first every time we go out of town because we know our family and our home will be in good care. 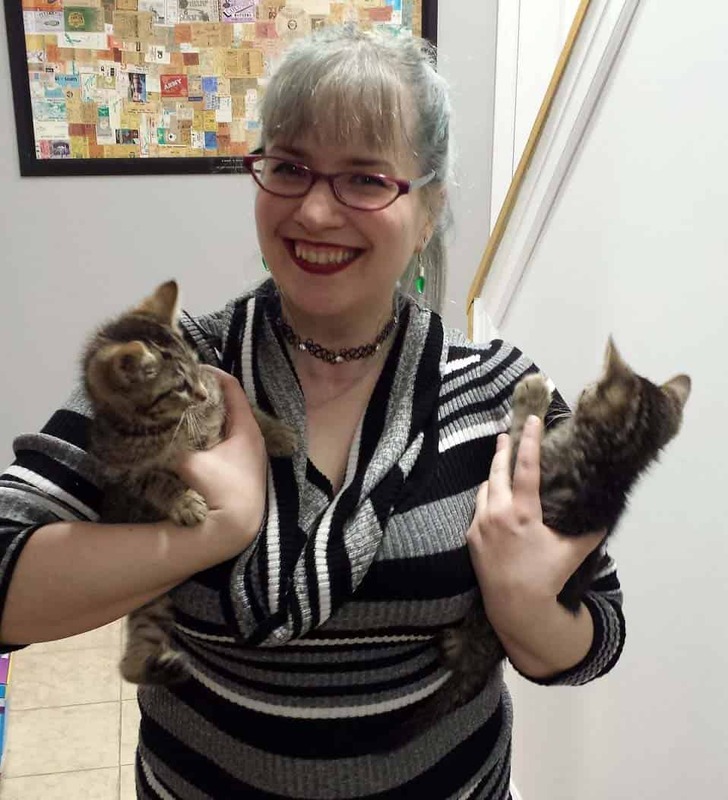 Jack, Peep, and Twitch always look forward to seeing her!” – April B.
Marion has a background in traditional and alternative health and healing and has always had a tenderness for animals, especially cats. After moving to the US at a young age from Germany she saw her very first cat while playing in the yard. There was an instant feeling of pure joy and love. They became fast friends and since that time cats have been a major part of her life. 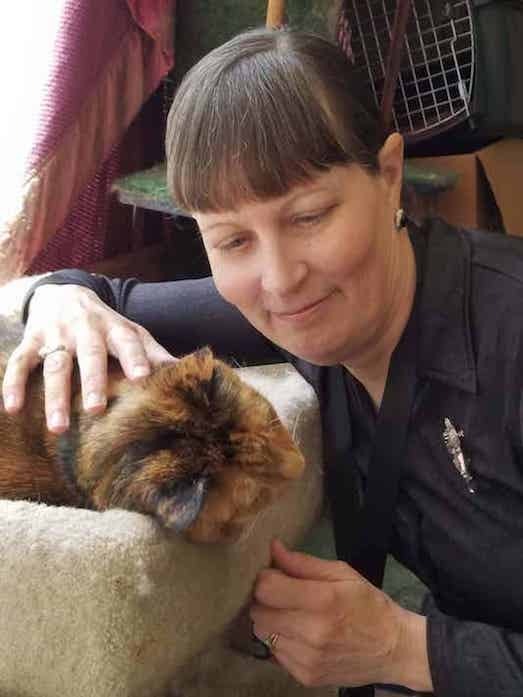 She offers not only experience, but also the ability to connect with the needs of both cats and cat guardians, knowing it is a very special relationship. She happily serves cities across the Peninsula. Janet relocated to Las Vegas two years ago with her fiance’ and two cats, Pixie and Skylar. She is originally from the Pacific Northwest, but traded rainy days for sunshine. Her two passions in life are cats and Art. When she is not playing with cats she is most likely painting portraits of them. Animals have been in her life for as long as she have been alive and cats have owned her heart for as long as she can remember. 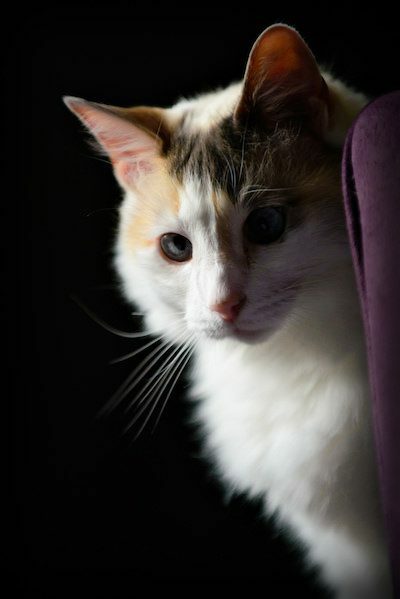 Janet has taken care of many cats through all of their stages of life from kitten to elderly. She’s participated in the rescue and re-homing of strays. 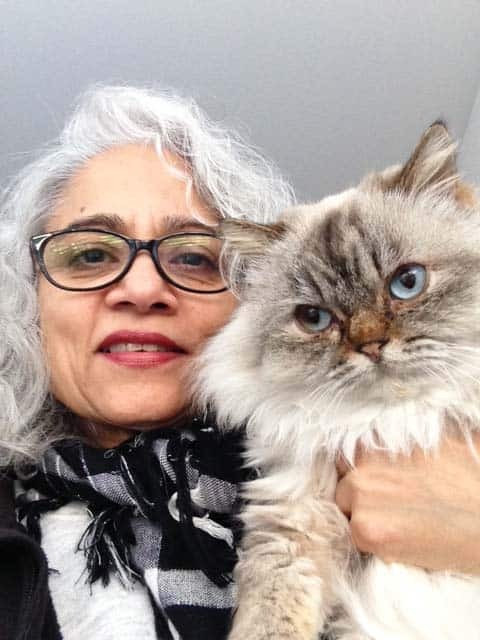 She’s fostered cats her entire adult life and has always been passionate about their welfare. They are all precious to her and every cat is worthy of the utmost affection and love. That is the mindset and attitude she brings each time she cares for your beloved feline! “When I had to leave for a week Janet took extremely good care of the cat. She made sure there was clean water, wet and dry food and she cleaned both litter boxes. I’d use her again!”. Eugene W.
How are you sitters selected and what type of training do they receive? Every sitter at The Comforted Kitty is selected for their years of cat care experience, excellent customer services, and proven exceptional work ethic and we are proud to pay well above minimum wage in order to attract and retain the best caregivers. All undergo a rigorous three part interviewing process, extensive reference check, and must pass a criminal background check. They are covered under our commercial liability insurance and bonding policies and our workmen’s compensation insurance. Once hired, they undergo a thorough orientation that introduces them to our professional policies and procedures and they sign a lengthy employee handbook that commits them to consistently upholding these professionalism. Since we believe no amount of reading can replace on-the-job training, each sitter is then “shadowed” by an experienced training sitter to ensure they are not just saying they will commit but actually demonstrating it. Upon completion of this training only then are they aloud to care for our client cats by themselves. Will I get to meet my sitter beforehand? Absolutely. 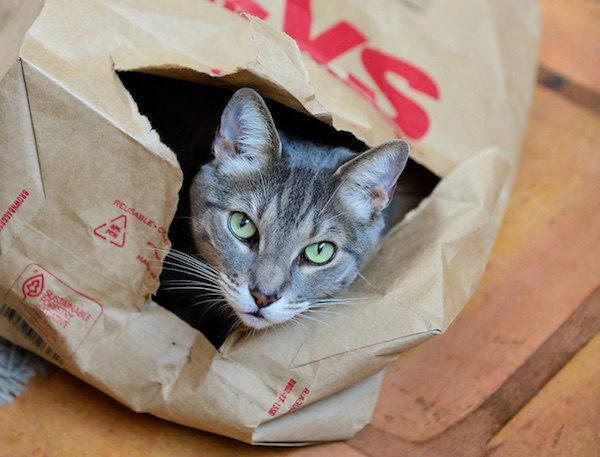 In fact we require a free initial consultation meet and greet with you as a new client so that they can come over to your home to see if they are a good fit for you and especially your cat. It also is an opportunity for the sitter to familiarize themselves with the entire visit care routine, retrieve your house keys, and ask you any questions or concerns they have so that they are totally prepared for the sittings. How many sitters will be caring for my cat? We believe it is very important for a sitter to develop a relationship with our human and clients and form a strong bond with their cat. Only your one assigned sitter (the person you meet and the initial consultation) will be entering your home to care for your cat. Unlike many other pet sitting companies and dog walking apps that are popular these days, you will always know ahead of time who is coming in your home and we never bring another person or animal into your home. No bait and switches! Will I have the same sitter each time I use your services? While we do assign one sitter as your primary sitter and strive to have that person care for your cat each trip, we cannot guarantee their availability each time, due to such factors as illness, personal obligations, vacations or other schedule conflicts. If we have to assign a substitute sitter to help you out, you will always get to meet that person beforehand to see they are a good fit with your cat and also go over the whole visit care routine. And rest assured they are a The Comforted Kitty sitter who is background checked, insured, bonded, fully vetted and covered under our workmans compensation insurance. Also, all of your care routine and contact information is stored securely in our pet sitting software so that regardless of which sitter helps, they will always have the most up-to-date information to complete the care properly without any confusion. Absolutely. Check out our Happy Clients page, as well as our Yelp, Google, and Facebook review pages. Lot’s of our current clients are eager to share their experience using our professional cat sitting services! Crazy about cats as much as we are? If you answered YES! than we are looking for you. At Comforted Kitty, it’s never just about being a cat sitter. It’s about providing companionship and excellent care to our feline clients. Join us and together we will continue to uphold the higest standards in the cat care industry.